Hi, I'm Cass, and I'm here to help you. 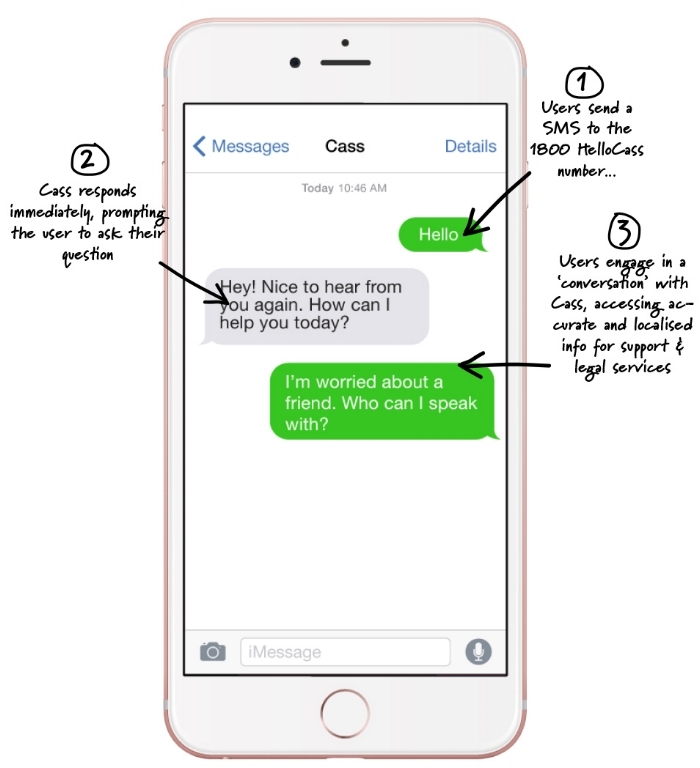 Hello Cass is an SMS chatbot providing instant, anonymous and accessible information for those experiencing or affected by family or sexual violence… and it feels just like texting a friend. Made accessible via simple SMS technology and with content co-created with community health and service providers, Hello Cass helps users quickly and intuitively find their pathway to safety. When users chat with Cass, a friendly chatbot, they are accessing content and support from violence prevention and support agencies, as well as health and legal service providers. We are partnering with peak bodies, service providers and community organisations to ensure Hello Cass’ content is accurate, relevant, culturally-safe, and inclusive. We are welcoming new partners onboard everyday, so if you'd like information about how you or your organisation can get involved, get in touch, or check out the Hello Cass website. Help us launch in 2019! Whether you're a potential partner, funder or a community member who'd like to share their thoughts, we'd love to hear from you. Send us an email, contribute your question for Cass below (email optional), and subscribe to our newsletter. We'd love you to join us in working towards a future free from family & sexual violence. Sign up with your email address and we will keep you posted on key developments for Hello Cass as we prepare to launch in 2019.